In 2007 I was very happy to be invited to join Salima Ikram and Corinna Rossi‘s North Kharga Oasis Survey (NKOS). Great mission, great landscape. The landscape so breathtaking that I immensely enjoyed walking and looking for stone and quarries. Crude flint hammerstones turned up. One after the other, even small depots. Tracing the hammerstones for several kilometres paid off. 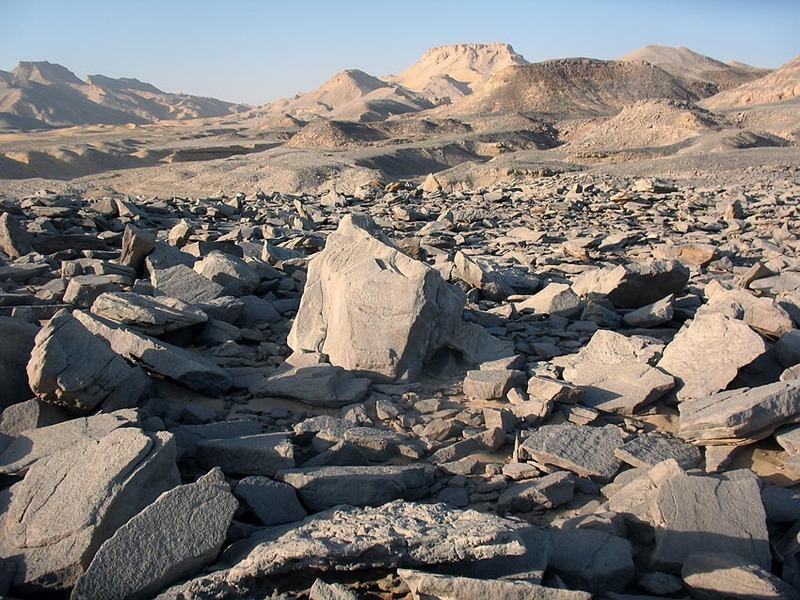 At the end of the trail was the first grinding stone quarry found in the Western Desert of Egypt! It was clear that there ought to be grinding stone quarries in Kharga. 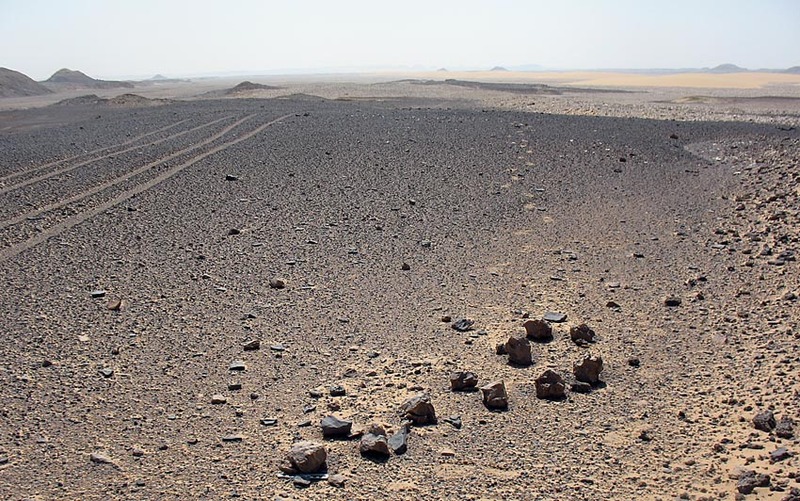 For like elsewhere in the Sahara there are numerous grinding stones at habitation sites from the Holocene “wet phase”, when the Sahara was “green” between roughly 10.000 and 5.000 BC, phasing out in the subsequent millennia of less and less rain. 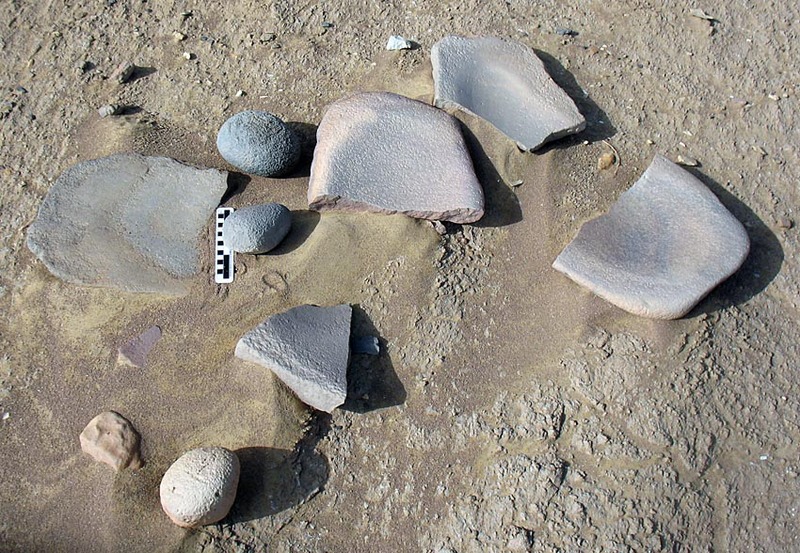 The “Saharan” grinding stones in Egypt’s Western Desert normally consist of a flattish, oval lower stone and a quite small roundish upper stone, which can be moved with one or two hands – to grind vegetable matter, including tubers and wild or domesticated grain, but also mineral pigments. But there is, of course, quite some variation in typology. It was, however, not clear where such grinding stone quarries might be located or whether they would show signs of organised work. The only thing we knew was that the grinders were often made from silicified sandstone (“quartzite”), which is a quite abundant rock in the Western Desert’s sandstone regions. Silicified sandstone is normal sandstone, which has become very hard through the geological history due to the deposition of silica in its pores. Thus a stone that is excellent for grinding purposes. Patches of silicified sandstone is found here and there also in Kharga, but few outcrops observed showed any signs of organised quarrying. Until Dirk Huyge and I started to follow flint hammerstones on a Pleistocene alluvial terrace heading towards the north scarp of the Kharga depression. The hammerstones were clearly produced from pebbles and small boulders of poor, greenish flint that had been deposited on the terrace back in the Pleistocene. Associated with the hammerstones were often a few inexplicable fragments of brown silicified sandstone, so obviously very minor work of some kind had been going on. We walked from hammerstone to hammerstone, up the terrace, and at one point I seem to recall that Dirk rather wanted to do something more rewarding… This was definitely not the most exciting archaeology in Kharga… Off he went to the nearby rock art sites, while I decided to see whether there was an end to the hammerstones, in the hope of finding an explanation for their presence. After three kilometres I got more than an explanation. For as I looked up from a group of hammerstones, a plateau overlooking the terrace caught my attention. Mainly since it was full of broken-up rock. So I walked up – and suddenly found myself in a wonderful grinding stone quarry – in silicified sandstone – full of blanks of oval lower grinders and handstones – as well as and fragments of our dear flint hammerstones that had been used as tools! Total excitement! But the sun was about to set, so I had to walk back to the camp – a very joyful walk! Good that they were followed, though, since they led to a great little quarry. There ought to be many more, similar quarries in Egypt’s Western Desert. This entry was posted in Ancient Egypt, Archaeology, Old quarries and tagged Ancient Egypt, ancient egyptian quarries, grinding stone, Kharga, quarry, ten quarries of ancient egypt. Bookmark the permalink. I remember, Per! Yes, I had an overdose of hammerstones at a certain point in time! But it was definitely a pleasant mission, yes.